Another recipe from our birthday bonanza. (And since it's Cinco de Mayo, I consider this one quite appropriate.) I know for most people, their idea of feeding a crowd usually involves a phone call to their favorite pizza joint or other restaurant. Unfortunately, when on the MSPI diet, that isn't always an option. So what's the trick to feeding a crowd? In order to keep my sanity the day of the event, I always, always plan a menu where the bulk of the food can be prepared ahead of time and reheated for the event. And tacos with all the fixings works great! Although these beans are good straight out of the slow cooker, they actually get even better when made ahead of time. The beans really soak in the flavor of the spices when allowed to cool and then reheated, which is why it is the perfect recipe when planning a get-together! The night before, sort and rinse dry pinto beans. Place in a bowl and cover with water. Soak overnight. 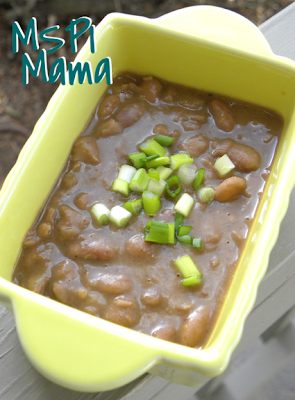 The next morning, drain beans and place them in a slow cooker with the other ingredients. Cover with the lid and cook on low for 8-10 hours, or until the beans are tender. Add salt, to taste, and adjust other seasonings as well. Quick Soak Method: Forget to soak your beans overnight? You can do the quick soak method by placing the beans in a sauce pan and covering them with water. Bring to a boil for two minutes. Remove the pan from the heat and cover with the lid. Soak for one hour. Drain water and proceed with the slow cooker. Stove Top Method: Don't have a slow cooker? Once the beans have been soaked, place them in a large sauce pan with the other ingredients. Bring to a boil, then reduce heat and simmer for two hours or until beans are tender, stirring occasionally. Add water, as needed, to keep the beans from drying out. Tip: Not a fan of onions and garlic? Only cut the onion in half and leave the garlic whole (but slightly smashed). When the beans are finished cooking, you can pick the onion and garlic out and throw them away.